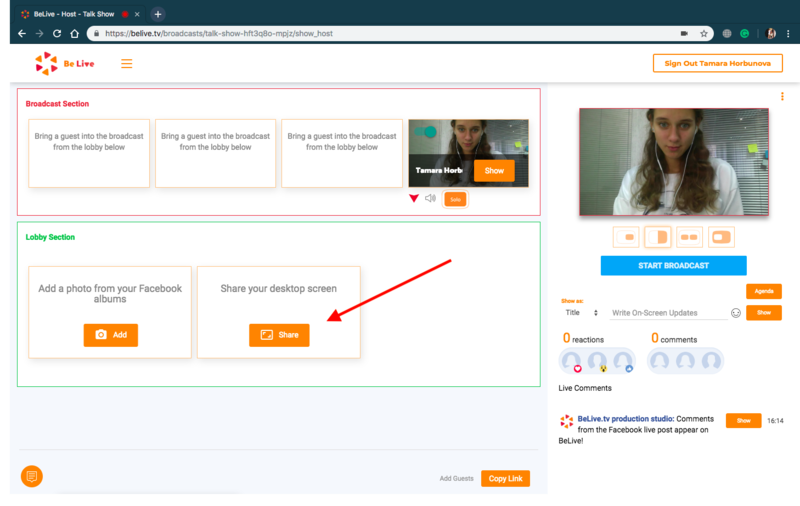 NOTE, currently screen sharing is available for host only! 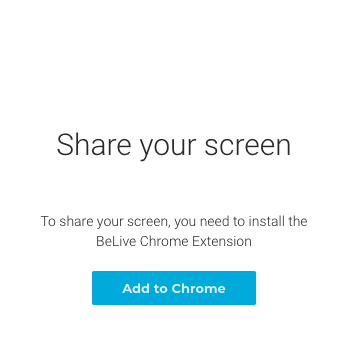 You will have to install the Chrome extension to be able to screen share. 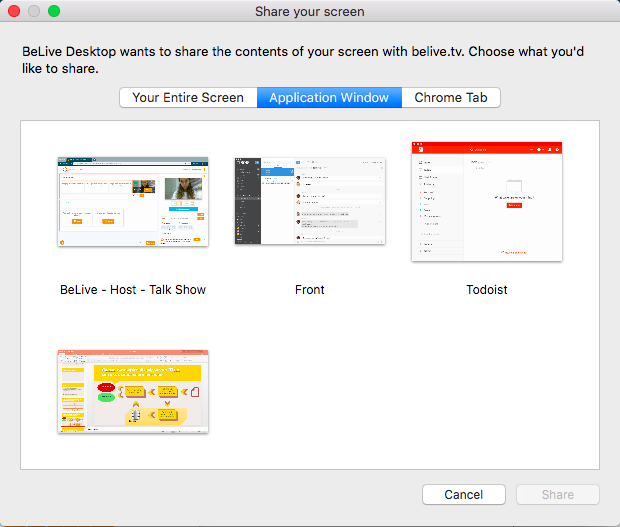 When you are going to screen share for the first time, Broadcast Studio will ask you to install the extension for Chrome automatically. By clicking the blue button "Add to Chrome", you will be instantly redirected to the Chrome Webstore. The extension can also be found via the direct link. Let’s start the screen sharing! So, you have created a Talk Show broadcast, now what? share the separate Chrome tab. To stop sharing the screen, you have to click "Stop Sharing" button. Also, refreshing the studio page will disconnect screen sharing. Now, let’s check all the available options of the screen sharing. This option will bring everything that you see on your screen - along with the status bar, the Dock panel and all the pop-up notifications that appear on your screen. Thus, we suggest you turn on the “do not disturb mode” on your device. On Mac, you have to have the application open, but not full-screen. 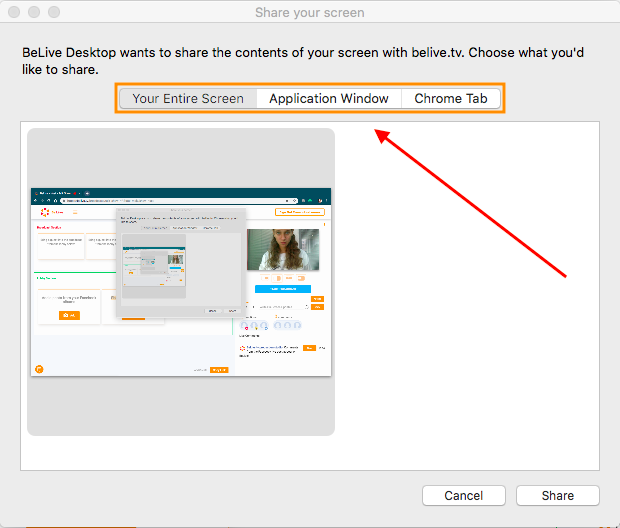 You will see all the available for sharing windows in the pop-up window (check the screenshot below). That can be your browser, keynotes presentation, or any other app. For the Windows devices application window has to be open (and not minimized to the Dock panel), otherwise it won’t be available for the broadcasting. You will see all tabs that are opened in this Chrome window, and if you tick the checkbox at the bottom, you will be able to share a sound from these tabs. For viewers to hear you during the screen share you have to add yourself (your camera) along with screen share to the broadcast area, so you can use your microphone to talk. If you don’t want people to see you, you can just press SOLO under the shared window. And here you will find a tutorial on how to show your PowerPoint presentation using a screen share. 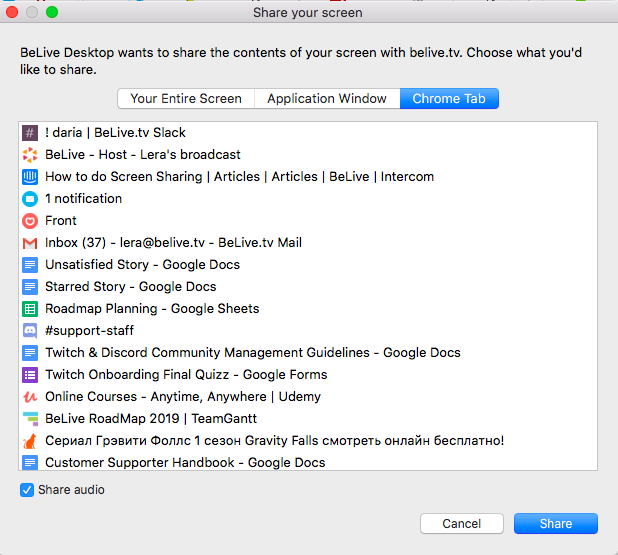 If you're experiencing any problems with screen sharing, you may want to try reinstalling BeLive extension in Chrome.